3 Blind Mice Window Coverings has a large selection of indoor window shutters to fit every taste and price range. If you’ve been dreaming about stylish window treatments for your home, custom shutters might be just the thing you are looking for. 3 Blind Mice Window Coverings has a large selection of indoor window shutters to fit every taste and price range. If you’ve been dreaming about stylish window treatments for your home, custom shutters might be just the thing you are looking for. To view photos and design ideas for your home, choose the type of shutters you are interested in from the galleries below. Arched windows always add an elegant touch to your home’s décor that can be appreciated for providing great views from inside and “curb appeal” from outside. When driving around San Diego, you can see many homes have these beautiful arched windows. 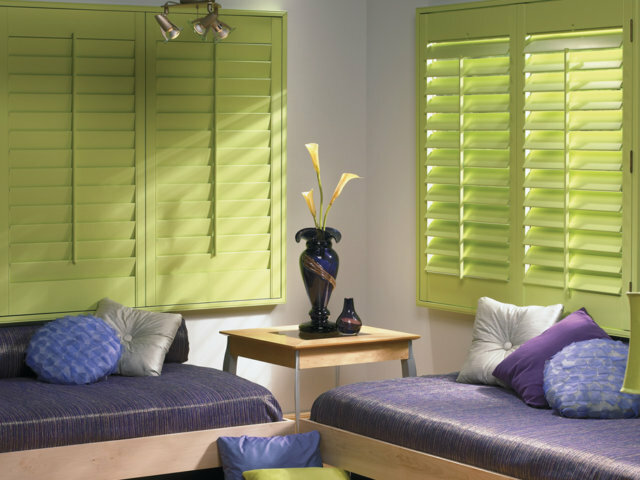 Faux wood shutters (aka Poly Shutters) are constructed from synthetic polymers or PVC. This style of wood composite shutter is heavier then real wood shutters, but they are also extremely durable, which is a wonderful advantage. 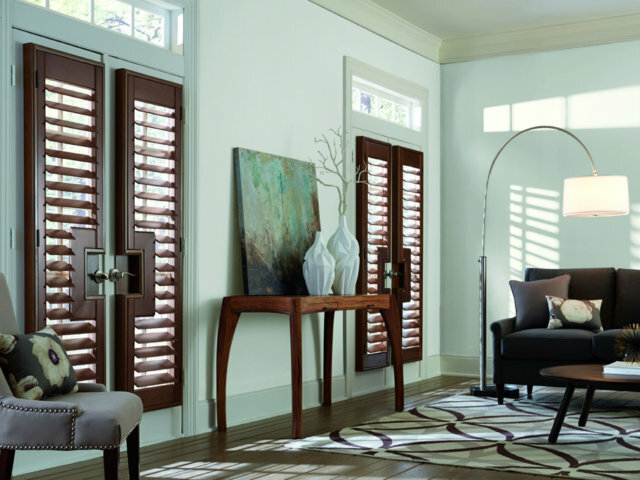 Plantation shutters are an elegant window treatment option available in oak, maple, cherry, basswood, aspen or poplar, and can be custom stained to match your home’s decor. One of the best things about custom shutters is that the different options you can choose from come in all kinds of price categories, assuring that even a modest budget can afford the sophisticated look of shutters. 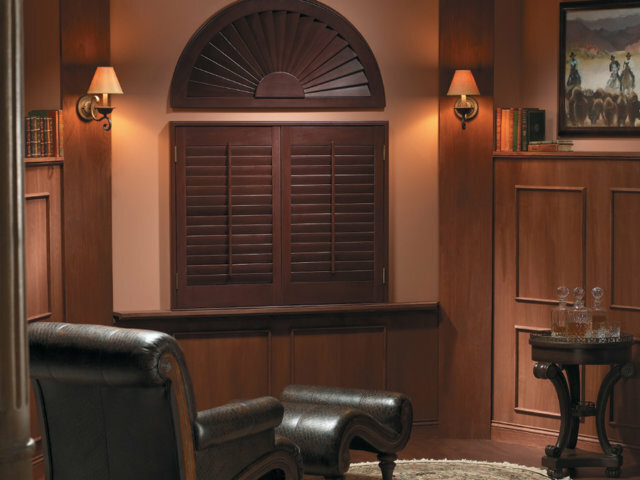 While there are pros and cons to each variety, real wood shutters offer you the most flexibility when designing custom shutters because the wood can be custom stained with any finish, and/or cut to fit any sized window. Vinyl is less expensive than real or faux wood, and is especially good for high moisture areas like laundry rooms and bathrooms. Composite faux wood shutters are a good middle of the road product that will give you the look of real wood at a cost closer to vinyl, and while they are not as good as vinyl in high moisture areas, they are better than wood. All types of custom shutters are available in natural wood tones, stained or painted variations allowing you to pick a style and design that will seamlessly flow with the interior design of your home. Besides being durable, functional and easy to use, one of their unique features is the curb appeal that they add to your home. Panel configurations – there are many ways to configure your panels from cafe style to double hung, to bypass to bifold there are a large number of configurations that best suit your needs. Interior shutters are a great window treatment idea for families with small children because they do not have any dangling cords or strings that children can get tangled up in. In addition to shutters, we provide a variety of cordless & child friendly window treatments as well as motorized window coverings that will eliminate hazardous pull cords from your home and give you one less thing to worry about! Shutters are usually hinged on the outside of the window frame and swing open to allow access to the window or to allow light in. Operable slats can be adjusted to accommodate light, airflow or privacy concerns. They are also available in multiple tears allowing for half of the window to have the slats open while the other half remains closed giving you even more control over light and privacy.